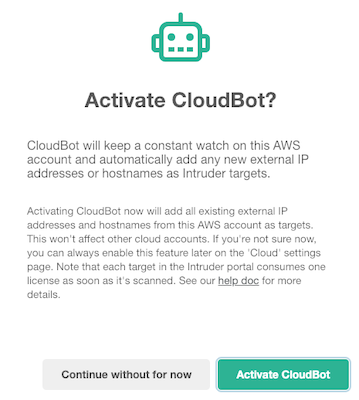 CloudBot keeps a constant watch on your cloud accounts and automatically adds any new external IP addresses or hostnames as Intruder targets. Why do I need CloudBot? Keeping on top of your Internet-facing systems' security can be tricky, and cloud computing hasn't always made that easier. It's now very easy to spin up new VMs and containers in AWS, Google Cloud or Azure, so keeping on top of any new systems that are exposed to the internet and ensuring they are monitored for weaknesses can be a challenge. This is where CloudBot comes in... Activate it for your connected AWS, Google Cloud or Azure accounts and it will periodically check if there are new IP addresses or hostnames it has not seen before. If CloudBot sees something new, it adds that system to your targets list and will then monitor it for security weaknesses. Whenever CloudBot adds new targets to your account, we'll send you a Slack and email notification telling you which targets were added. How do I activate CloudBot? CloudBot can be activated individually for each cloud account you connect to Intruder. If you activate CloudBot for one cloud account this will not affect any other cloud accounts. How do I disable CloudBot? Head to the 'Cloud' settings page and click the CloudBot icon. If it's green that means CloudBot is active for that cloud account, if it's grey CloudBot is disabled. If you disable CloudBot, you can still manually add targets from your cloud accounts via the "Add from Cloud" popup on the targets page. What I exceed the licenses in my account? CloudBot will automatically add new targets until you've reached your license limit. We'll notify you about any targets that CloudBot could not add if all your licenses have been consumed. See our licensing help page for more information on how our licensing works. Note: CloudBot is only available for customers on our Pro and Verified plans.